Sagrada Review - A Beautiful Game That You Will Love To Play — GamingWithSwag.com - Dads By Day, Gamers By Night. 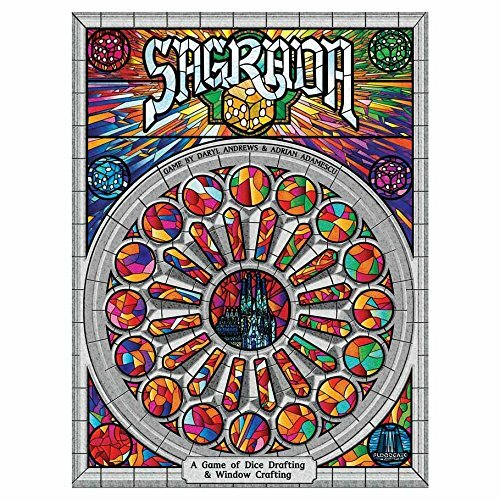 In Sagrada, players are designing stained glass windows for the famed Sagrada Familia church in Barcelona, Spain. In game play terms, players will be drafting dice from a pool in order to try and fill a board showing a particular window design. Points will be scored for completeness, as well as additional attributes shown on public scoring cards. At the start of the game, players will each get a window board. Part of this board has a clear covering, under which players will slide in a pattern board. This pattern will show a series of spaces that the player will need to cover. Some spaces may have to be covered with either a specific colored die, or a specific “shade” of die. The different shades are denoted by the number of pips on the die. Therefore, a lighter piece of glass has fewer pips. Each pattern board also has a difficulty rating. The more difficult the pattern, the more “tool tokens” that player will receive. Each player will also get a secret color card, where they will get a number of points equal to however many dice of that color they use in their window. The first player takes a number of dice randomly pulled from a bag based on the number of players, and rolls them Players will then take turns drafting dice, and placing them into their window display. The first die must be placed into a corner space or on an edge space, and subsequent dice must be placed adjacent to any previously placed dice (diagonals are allowed). The rules of placement are where the challenge of the game. Dice sitting directly next to each other may not be the same color or the same shade. Diagonally, dice can be the same. Also, keep in mind that specific spots on the player board demand specific dice. It doesn’t take long, especially if you are trying one of the most challenging windows before your choices become teeth-grindingly painful. This gets doubly difficult when your personal goal contradicts the public goals. You really have to puzzle out which choices will get you the most points. I’ve heard it called stained glass Sudoku a few times. It’s not totally accurate, but it isn’t far off. To help just a little bit, there are some public tool cards that can twist the rules ever so slightly. The first person to use a tool card has to pay one of their tool tokens. Each time that same tool is used again, a player must pay two tokens. A game lasts 10 rounds. Each round, players will draft 2 dice. These 20 dice, not so surprisingly, are exactly how many you need to fill your window. So, if you get stuck and can’t play a die, you will lose points for the blank spaces you may leave. One the 10 rounds are over, players go through each of the public goals and the personal goal card to total up scores. Players will get 1 extra point for each unused tool token but will lose 1 point for each uncovered space on their board. The rulebook is very simple to read and understand. The entire book is only 4 pages long and includes several large, clear illustrations to aid in comprehension. I can’t see players really needing the book anymore after the initial read. I find the theme fascinating. You just don’t see many games about designing stained glass windows. In its own abstracted way, Sagrada actually manages to deliver fairly well on that theme. By the end of the game, you have an absolutely gorgeous board that does have at least a passing resemblance to a stained glass window. Choosing the window how players want to develop is the only thing that takes any time at all. Each player is given 2 double sided window cards, must choose 1 of those cards, and then which side to work on. Everything else is just a quick shuffle and a flip to get ready. Putting the game away doesn’t take very long either since all the dice just dump into a large bag. This may actually be the best part of the game. The player window boards are big, bright, and extremely sturdy. The dice are all see-through jeweled plastic and look great on the board. I can’t say anything negative about the components. Please note: my pictures are of the Kickstarter edition, but the regular edition components are almost the same. There are rules included for a solo variant. It’s difficult. It doesn’t change the way you play the game too much, but it places a real emphasis on being careful as to which dice you don’t use, as those become the score you are trying to beat. Sagrada has a lot of things going for it. It’s an easy to play game that starts very innocently. After just a couple of turns though, players will be invoking various Gods / Demons to get that one die you need to complete your window. I think Sagrada has the potential to become one of the new great gateway games. It has the look, the game play, and the unique theme that sets it apart from the pack - at a really great price point. I highly recommend players give Sagrada a try.